As you perhaps suspected already after reading the title – this will not be a funny post. I have migraines. For a very long time I had simply one or two a month shortly before I got my mens. Also traveling could provoke a migraine. But this was no problem at all. I could take a simple over the counter medication and lay down, afterward all was well. But with increasing commitment in my job as a teacher for yoga therapy, the traveling volume increased. As it is perhaps ironic for someone who teaches body awareness and related health techniques – I did not recognize how the migraine frequency increased (ok… maybe I was distracted by a car accident I had, a Taxi driver hit us on Silvester). It all culminated around some two years back as I got a migraine attack during working which did not receded for 5 days. After this – in my perception – everything changed. The migraine pain was much harder, the medication did not help (yes I consulted a specialist and did not self-medicated) and the frequency increased; I eventually had to stop to work to get some days without migraine. So, after all the whining: here I am two years later after countless therapy attempts. The frequency decreased a little bit to about 5 days with severe migraines per month. Now the crafting sets in. After an attack the headache and miss-feelings are not simply gone, but I have a lingering pain, nausea, and often numb parts in my face for one or two days. Although body and brain hinder me to do many things, knitting/crochet with its small and easy movements is still possible. And while doing one stitch at a time I accomplish something greater. I can overcome the feeling of getting nothing done or being useless while being in pain, because after some time there will be a finished object – a sweater, a hat or simply a nice tension square with a new pattern. Knitting/crochet is for me a compromise when my body hurts too much to write or work, but not enough that I must lay down. Being in pain or feeling sad about the pain and its consequences is not a pleasant place to be. 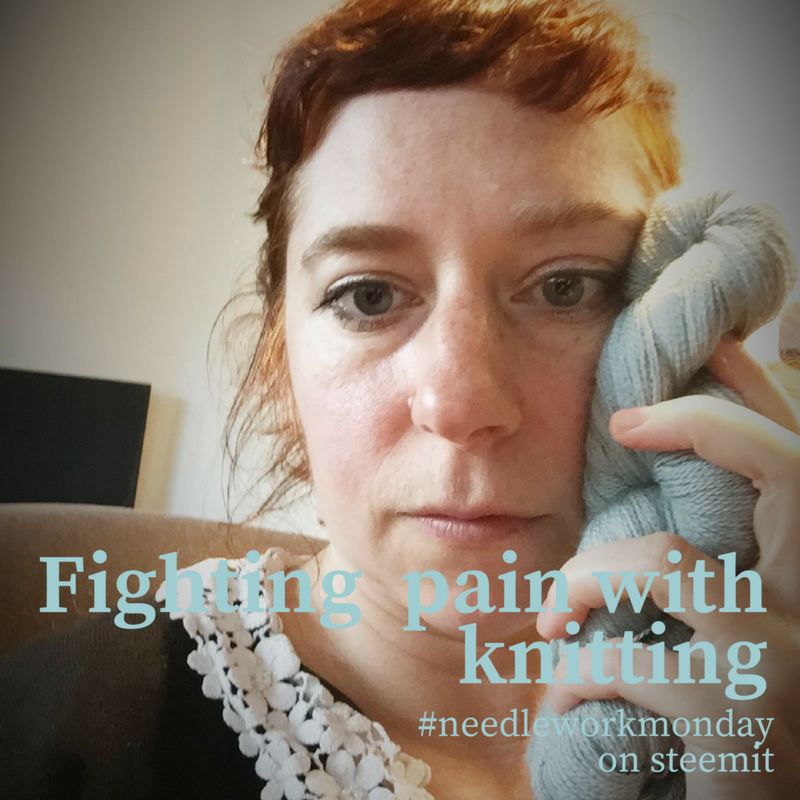 Through knitting/crochet the pain will not go away, it is no miracle cure, but it can help to calm down and to concentrate for moments (or longer) on something else than the hurtful feelings. The repetitive movements of knitting and crochet can lead to a meditative state without needing to learn special concentration techniques. It is simply a very positive side effect of doing the same and effortless movements for a longer time. Sometimes my migraines make me so sad and angry, I envision the darkest future scenarios, being a burden for the world, being alone and in pain, not able to be productive and so on. My mind is very creative in painting everything black. In such moments knitting/crochet can bring me back to reality. Especially more difficult patterns, which need my concentration are a good remedy for rumination which could evolve into health issue itself. But also, the clicking noises of the needles, the touch of the yarn can anchor me in the present and penetrate negative thought cycles. But Knitting/crochet has even more potential. For example, both crafts allow to work and speak. So, you can connect with other people while knitting this lovely shawl or sweater. The knitting/crochet projects are transportable. Knitting and crochet is said to be inexpensive (if you have a whole room for your yarn stash and your tools need their own flat, there may be potential to economize your hobby) And knitting/crochet even facilitates the growth of new neural pathways which could delay or alleviate dementia. If you want to read more about the benefits of knitting I would recommend Betsan Corkhills book “Knit for Health & Wellness” published by FlatBear in Bath 2014.